Using new imaging tools with spatial resolution up to a million times higher than clinical magnetic resonance imaging and new techniques for 3D shape analysis, a team of scientists shed new light on alcohol-related birth defects in their animal-based study. Chapel Hill, North Carolina – A collaborative research effort by scientists at the University of North Carolina School of Medicine, Duke University, and University College of London in the UK, sheds new light on alcohol-related birth defects. The project, led by Kathleen K. Sulik, PhD, a professor in the Department of Cell and Developmental Biology and the Bowles Center for Alcohol Studies at UNC, could help enhance how doctors diagnose birth defects caused by alcohol exposure in the womb. The findings also illustrate how the precise timing of that exposure could determine the specific kinds of defects. Fetal alcohol syndrome (FAS) is at the severe end of fetal alcohol spectrum disorders (FASD). First described in 1972, FAS is recognized by a specific pattern of facial features: small eyelid openings, a smooth ridge on the upper lip (absence of a central groove, or philtrum), and a thin upper lip border. In their animal-based studies, the Sulik lab team has collaborated with co-author G. Allan Johnson, PhD and his group at Duke University’s Center for In Vivo Microscopy. Johnson, professor of radiology and physics, has developed new imaging tools with spatial resolution up to a million times higher than clinical magnetic resonance imaging (MRI). These include small bore tools suitable for imaging fetal mice that are only 15 mm long. To quantify facial shape from MRI data, the study team turned to co-author Peter Hammond, a professor of computational biology at UCL’s Institute of Child Health, in London. Hammond invented powerful new techniques for 3D shape analysis that have already proven successful in objectively defining facial shape changes in humans. In the study, described in the August 22, 2012 issue of the online journal PLOS ONE, Lipinski and Sulik treated one group of mice with alcohol on their seventh day of pregnancy, a time corresponding to the third week of pregnancy in humans. A second group of mice was treated just 36 hours later, approximating the fourth week of human pregnancy. The amount of alcohol given was large, “high doses that most women wouldn’t achieve unless they were alcoholic and had a tolerance for alcohol,” Sulik said. Near the end of pregnancy, the fetuses were then imaged at Duke University. These 3D data sets showed individual brain regions, as well as accurate and detailed facial surfaces, from which Hammond and research assistant and co-author Michael Suttie performed shape analyses. 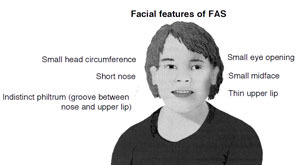 The team found that the earlier alcohol exposure time elicited the classic FAS facial features, including characteristic abnormalities of the upper lip and eyes. What they observed in fetuses exposed just 36 hours later, however, was a surprise. These mice exhibited unique and in some cases opposing facial patterns, such as shortened upper lip, a present philtrum, and the brain, instead of appearing too narrow in the front, appeared wide. Co-authors include Shonagh O’Leary-Moore, Jacob J. Ament, Stephen J. Pecevich, Scott E. Parnell, Elizabeth A. Godin, Joshua L. Everson, Deborah B. Dehart, and Hunter T. Holloway of the UNC Bowles Center for Alcohol Studies; Francois Budin, Ipek Oguz, Martin A. Styner of the UNC department of psychiatry; and Yi Jiang of the Duke University Center for In Vivo Microscopy. Be the first to comment on "New Techniques Yield New Info on Alcohol Related Birth Defects"